This time of year the Sunshine State tends to lure tourists and snowbirds looking for an escape from the bitter cold. As a result, our roads can get more crowded and there tend to more auto accidents. 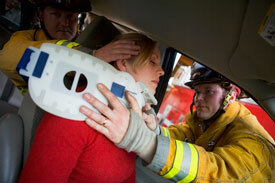 If you find yourself a victim of an auto accident, there are some critical steps to take. If you injured soft tissue (muscles, ligaments and tendons) in an accident, which may not bother you too much initially, you should come in for care as soon as possible. Putting off treatment can lead to debilitating scar tissue and adhesions. We always teach our patients that how you feel is a poor indicator of how healthy you are particularly with soft tissue injuries. The absence of pain doesn’t mean you’re okay. We hear people say, “My knee or shoulder hurts today, so I think it’s going to rain.” There’s a lot of truth in that because those individuals probably suffered from soft tissue injuries in the past. What happens is every one of the joints in your body is surrounded by a pressurized joint capsule, so when the barometric pressure changes in the environment the joint either expands or the capsule expands or contracts. If that capsule is attached to that scar tissue that’s been there from past injuries, and it’s weaker, more pain sensitive and less elastic, that’s why they feel it. Scar tissue forms because the tissues don’t heal correctly. They heal with all these cross-directional fibers. You can liken them to spider webs. We need to help remodel the tissues so they can heal properly — in a parallel direction, so they’re strong. It’s particularly vital to get checked right away in Florida because we have a 14-day rule. If you don’t go to any medical or chiropractic provider within 14 days, you lose your personal injury protection benefit. So if you have a fender bender or more serious accident, it’s helpful to at least get checked and get it documented even if you feel okay.